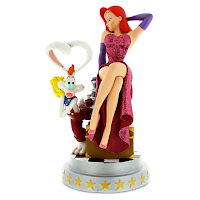 At D23 2013, a Roger and Jessica Rabbit 25th Anniversary statue by COSTA ALAVEZOS was released which was similar to a big figure made many years ago. This smaller version stands at 12" tall and is now selling through the Disney Store Website It is a full resin statue with dark-pink glitter accents to Jessica's dress. It's selling for $95 and appears to be an Open Edition piece. Why dont'cha do right and p-p-please give a good home to this delightful fully sculptured statuette featuring 'Toontown's premiere cartoon couple. You'll be drawn to them instantly!"